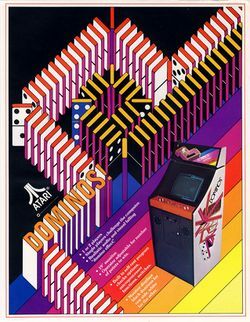 Dominos is an arcade game that was released by Atari in 1977; it utilizes a Motorola M6502 running at 756 KHz, and the players must use four directional buttons (as opposed to a 4-way joystick) to set up a line of dominos (white for 1P and black for 2P, but if there is only one player the CPU shall fill in for 2P) then try and force their opponent to run into the walls or their trail (and make all their dominos tumble, as a result). Each time this happens, the surviving player receives one point (which is shown at the top of the screen) - and once either player's received between three and six points (depending on how the cabinet is set) he will win the game. The gameplay can also be considered similar to that for Gremlin Industries' Blockade, Comotion and Hustle, which were all released in the previous year. This page was last edited on 5 November 2014, at 16:16.